Since the late 90s Qwerty has released several albums of experimental electronic music as both qwerty and Spleen on the Phthalo, Piehead and Kitchen Sink labels. 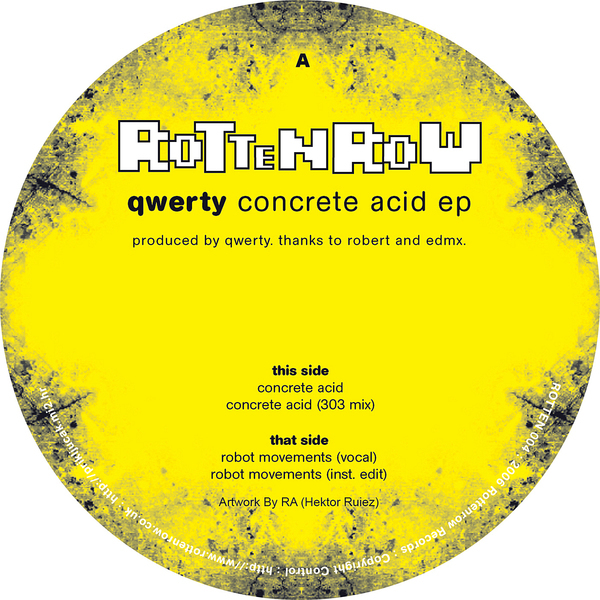 The Concrete Acid EP is his first vinyl release and features 4 concrete-solid electro acid-influenced tracks which are both dancefloor honed and jittery percussive. Stylistically the EP is a homage to labels like Metroplex which favoured the classic 2 tracks plus versions approach. "Concrete Acid" lives up to it's title, and is a combination of hard hitting drum machine grooves and wonky 303 lines executed with twisted precision. The 303 mix features some melodic assistance from Ed DMX! "Robot Movements" rotates around driven 808 beats, acidic blips and monotone vocals - and a dub is included.